a temporary depolarization of postsynaptic membrane potential caused by the flow of positively charged ions into the postsynaptic cell as a result of opening of ligand-gated ion channels. result from the flow of negative ions into the cell or positive ions out of the cell. Found in platelets and GI tract (enterochromaffin cells) as well as brain. Receptors – mu, kappa, delta – all three are G protein coupled and inhibit adenyl cyclase. 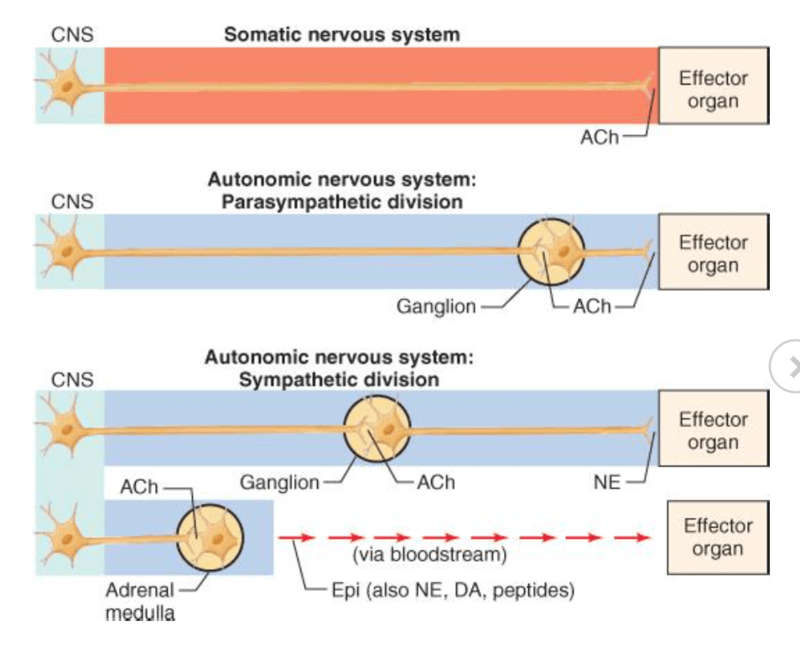 Action potential reached end of nerve –> Ca2+ enters via voltage gated channels –> Acetylcholine released–> Ach binds to nicotinic receptors on muscle –> Na influx –>voltage gated Na channel open –> propagation of action potential in muscle. 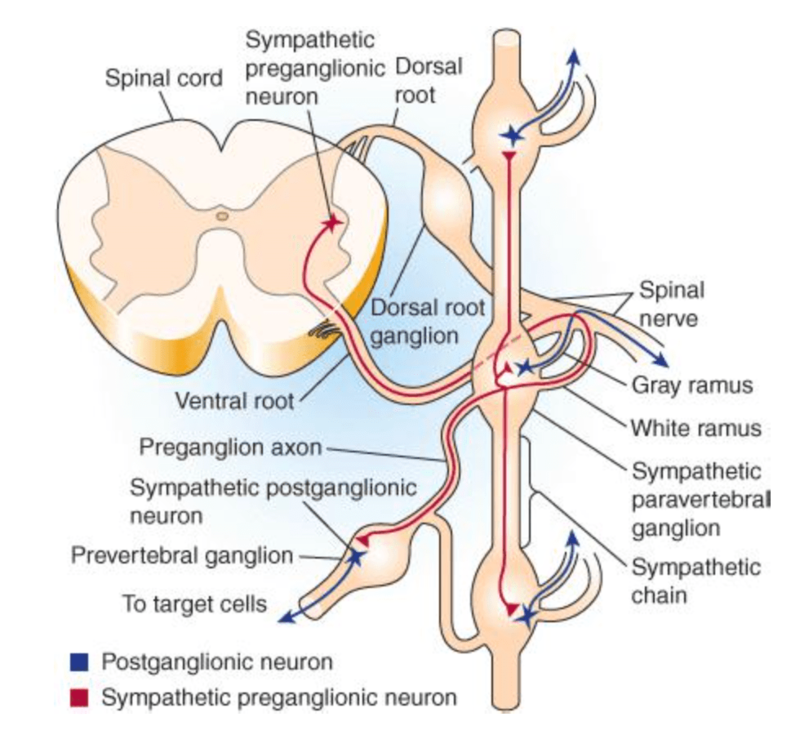 Motor neurons are A (large and myelinated), preganglionic neurons are B (small and myelinated) they then have 8 or 9 post ganglionic neurons each which are C fibres (small and unmyelinated). Describe neuromuscular transmission at the motor end plate. What are the different types of opioid receptors and their actions ? What is an EPSP / IPSP ? How are catecholamines metabolised ? 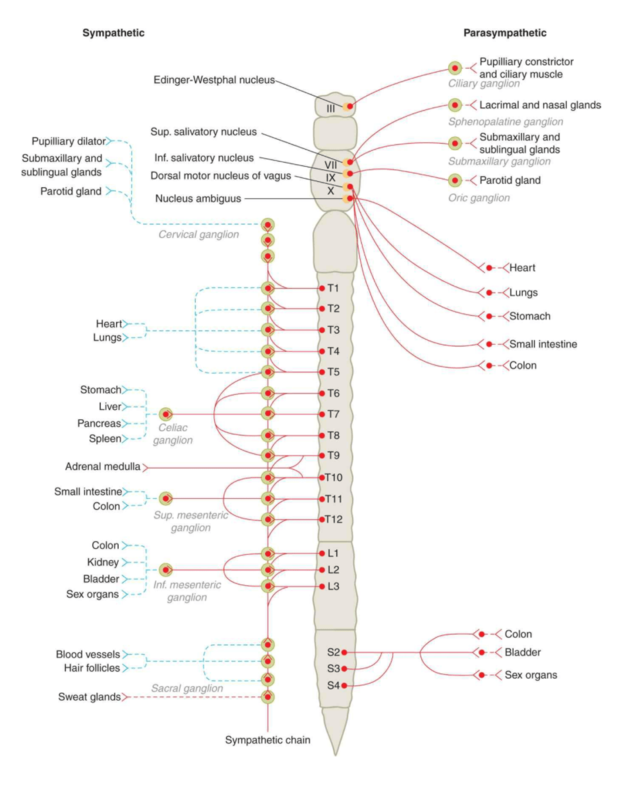 Describe the organisation of the Autonomic nervous system. Describe the distribution of cholinergic / noradrenergic / a1 / a2 / b1 / b2 receptors. What would be the effect of a cholinergic / adrenergic agonist / antagonist on the eye / heart / Peripheral vessels / lung / G-I system / bladder / skin etc.